Matthew Stevens is hoping to be the man to end 17 years of home misery in the Welsh Open. Two-time world champion Mark Williams, Wales' top ranked player, was the last home winner back in 1999. A total of 10 Welsh players are in the field for the event that sees John Higgins defending his title. "I'm feeling good. I have been working hard on the table and in the gym and my form is good. I am looking forward to playing," Stevens told BBC Wales. "It's a long time since a Welshman won our Open and it is going to be difficult for us to win it this year, even with 10 entrants. "Out of the 10, there aren't many with great experience, but they will enjoy playing in this environment. "But someone has got to win it. It's a funny old game and hopefully it can be one of the Welsh players." 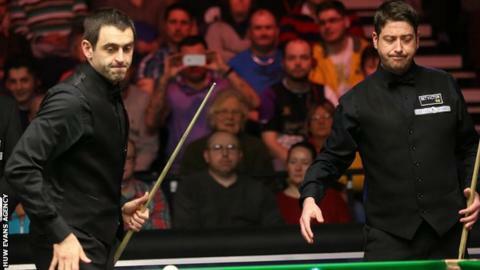 Stevens beat Ronnie O'Sullivan in the third round last year, before losing to Marco Fu. "Beating Ronnie O'Sullivan last year showed that in best of seven frames it levels itself out," Stevens said. "But it was the first time in a number of years I had beaten him and I hope I can replicate that form." Duane Jones is the first Welshman in action, facing world number one Mark Selby at 10:30 GMT on Monday. Stevens is paired with Irishman David Morris and the duo begin their campaigns at 20:00 GMT.